Known for their vast and rich history, many Spanish monuments in California still draw large crowds of visitors each year. The memorials were established to honor many early European or Spanish explorers and settlers who came to North America. Here are the stories behind a few of the Spanish monuments in California. Located in San Diego, California's Point Loma neighborhood, this monument was erected to pay homage to Juan Rodríguez Cabrillo, who led the first European expedition to explore what is now known as the West Coast of the United States. He was a conquistador who served under the leadership of in infamous Hernan Cortez. This journey of discovery started June 27, 1542, and three months later, he arrived at Point Loma. Cabrillo also journeyed further north, where later landed in Monterey Bay and Point Reyes, California.He unfortunately died during his expedition, so he never made it to San Fransisco, but his crew pushed as far north as Oregon. The Cabrillo National Monument was established in 1913 after being memorialized by U.S. President Woodrow Wilson. The memorial is part of California's National Park Service and includes tidepools, the Old Point Loma Lighthouse, walking trails, a statue of Cabrillo, a whale outlook and a bookstore/visitor center. 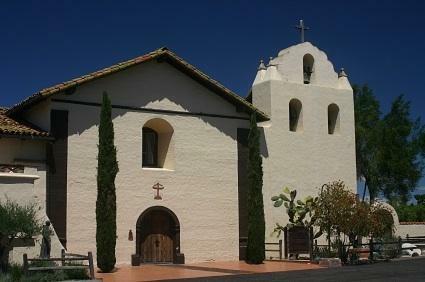 Although not monuments in terms of statues, the Spanish Missions (also known as the California Missions) are a series of religious outposts created by Spanish Catholics of the Franciscan Order. They were established from 1769 and 1823 to help spread Catholicism to Native Americans living in various areas of California. A monument memorializing Father Junipero Serra, who founded nine of the missions, was erected in 1965 at the State Capital in Sacramento, California. Spanish Landing Park: Built directly across the street from San Diego International Airport, Spanish Landing Park commemorates the Spaniards whose lives were lost journeying to North America in 1769. The Spanish American War Memorial: Located in Sacramento, California, this monument was built in 1949 to honor all of the veterans of the Spanish-American War.